[GLaDOS] I suffered for this art. I don’t see why I should be the only one. In the days before I had Flash or played The Way of the Ninja incessantly, I spent a large portion of my time making elaborate animated PowerPoint slideshows, including such classics as “The Adventures of Jimmy the Computer-Engineered Bitmap Image” and “Poor Shark”. The former eventually turned into The Adventures of Jimmy (and also explains his last name in that series), while the latter was lost because back then our school’s administrators deleted everything off your network drive during the summer, the file itself was too big for a floppy disk, and jump drives were too expensive to own. Then around three years ago I stumbled across a very short, saved copy of “Poor Shark II”, which would now be roughly 12 years old. It starts off with the words on the title card collapsing on top of Shark. Then he gets hit by a baseball and explodes. Then he eats a time bomb shaped like a hamburger and explodes. Then he gets hit by a football and explodes. Then he gets eaten by Bullyfish. It’s pretty clear I was at the mercy of the selection of the Microsoft Clip Art Gallery here. 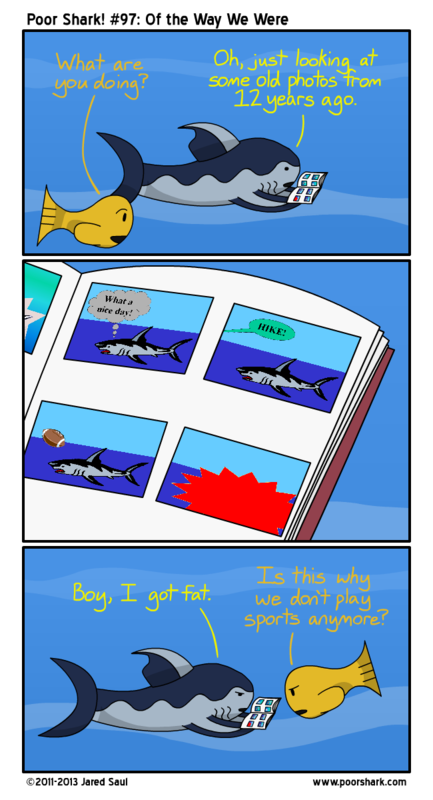 Anyway, it was so lame that I actually chuckled a little, and this webcomic was born. And now you know…the rest of the story.